Does it always feel like the other line is moving faster? When you’re standing in an airport this holiday season, you’ll probably feel this a lot. You’ll have to wait to check in (unless you do this at home), wait at the airport security checkpoint, wait to get something to eat and wait to board the plane. Invariably, you will become annoyed that everyone who chose the other line is moving along at a nice clip, while you’re only moving to shift your weight from one foot to another. There’s a reason for this: the odds are likely that the other line will be faster. Basically, it’s almost impossible for you to make a smart choice. Check out the video below to see why … you’ll have plenty of time to think about it when you’re waiting in line at the airport. Today is Cyber Monday. It’s the internet version of Black Friday. What does all this retail marketing speak mean? Well, it’s officially the holiday shopping season (with a special emphasis on the shopping). By now, your Thanksgiving leftovers have begun to spoil and your mind has replaced thoughts of turkey with lists of gifts for family, friends and coworkers. With so much emphasis on shopping, it’s easy to forget what the holidays are really about: togetherness, appreciation and, of course, fruit cake. You might find it odd for a snarky, sarcastic travel writer who was raised Jewish and then became agnostic to wax poetic about the holiday season when he’s supposed to be writing about SkyMall, but hear me out. 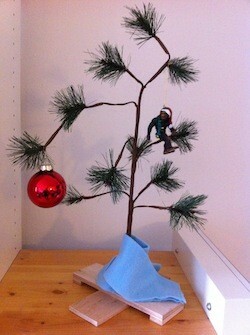 Here in the SkyMall Monday headquarters, we just set up our Christmas tree. I love this tree. It has its origins in all the things that make this time of year so special: family, SkyMall and Charlie Brown. This week is a little bit different for SkyMall Monday. Rather than simply reviewing a product, I’d like to share with you my story of the Charlie Brown Christmas Tree.As I mentioned above, I was raised Jewish. We were not a very observant family. Bacon cheeseburgers were enjoyed often and we only saw the inside of a synagogue when we were summoned to attend a bar mitzvah (including, oddly, my own) or a wedding. Sure, we’d light the menorah on Chanukah, but my extended family would gather at my aunt and uncle’s house for their annual holiday party on Christmas Eve. My aunt was Catholic, so it made sense. Also, no one had work the next day. Few offices tend to close for Chanukah and the adults usually enjoyed a fair amount of eggnog wine. My sister and I would receive our gifts on Christmas morning. Why? Well, probably so we could experience that special joy along with all the other kids around the world. Over the years, my family evolved. My parents divorced, my father remarried and we all stopped attending my aunt and uncle’s holiday party because, well, that’s what happens with families. The holidays became far less formal. Now, I visit with my mother to exchange gifts and spoil my nieces with toys. I go to my father and stepmother’s home for dinner and exchange more gifts. All of these gatherings are done on arbitrary days selected only because everyone’s schedule is free. There’s no dressing up. No huge gatherings. Just immediate family, a new generation of children and lots of laughter. In my mind, things have improved. I’m with the people I love the most and get to spend Christmas Day in Chinatown stuffing my face. My stepmother was raised Catholic and, as such, she and my father have a Christmas tree every year. She’s about as Catholic as we are Jewish, though, so there’s no nativity scene to be found in their house. Just plenty of holiday music and that great big tree. I’ve always cherished having that tree there. Not because it’s a symbol of Christmas or houses all of our gifts. I enjoy it simply because it means, after another long year, the people I love are together again. Last year, under that very tree, was an oddly shaped, awkwardly wrapped box bearing my name. It was long, three-sided and strangely light for its size. When the time came to open our gifts, I immediately attacked that mystery package. Upon opening it, I was delighted. I was 30-years-old at the time, but easily could have been three based on my reaction. There, in my very secular hands, was a Charlie Brown Christmas Tree. That’s the very same tree that I set up this morning. The picture you see above? I took that five minutes before sitting down to write this. It’s not the musical version sold on SkyMall. The catalog used to sell the silent model that my father and stepmother bought for me but, like all things these days, even the Charlie Brown Christmas Tree has received a technological upgrade. I, however, prefer my simple tree. It’s not really a celebration of Christmas. It’s certainly not a rejection of Chanukah or Judaism. It’s a reminder of what’s important. As you begin your holiday shopping, try to maintain some perspective about why this time of year is so special. Whatever your traditions may be, no matter how annoying your holiday travels are and regardless of your religious affiliation (including those who don’t have one at all), remember that this time of year is about family, giving thanks and Bigfoot Holiday Yeti Ornaments. Are you looking for a winter wonderland for the Christmas season? New England is a natural destination. There are plenty of deals to be found, with packages that won’t force you to choose between your trip and the number of presents under the tree. Check out the inns below from New England Inns and Resorts to see for yourself what await! 1. The Stepping Stone Spa, Lyndonville, VT The Kingdom Trails Winter Adventure package at The Stepping Stone includes two nights at this bed and breakfast, daily breakfast, two adult tickets for snowshoeing or cross country skiing at Kingdom Trails and a $50 voucher for dinner at Jupiter’s Restaurant. Rates start at $157 per person, based on double occupancy, and the deal runs from December 17, 2010 to March 20, 2011. 2. The Wentworth, Jackson, NHTake a look at this property for the Jingle Bells Chocolate Tour. For a rate that starts at $208, you’ll pick up a night at the Wentworth, an hour-long sleigh ride through Jackson Village (with actual jingle bells and chocolate snacks), a four-course candlelit dinner for two and a full breakfast the next morning. The deal runs from November 27, 2010 to December 18, 2010.3. Cranwell Resort, Spa and Golf Club, Lexington, MA Feeling the urge to hit the slopes before the end of the year? Check out the Berkshire Ski package at this property. For $140 per person midweek or $185 on the weekends, you can score a night at Cranwell Resort, unlimited cross country skiing, a $20 credit at any Cranwell restaurant and full use of the spa. The deal runs from December 1, 2010 to March 31, 2011. Ring in the new year at the Beachmere. The New Year’s Eve by the Sea package is pulled together to make the last night of 2010 memorable. The last dinner you’ll have this year includes appetizers, buffet and dessert, not to mention dancing and party favors. Start fresh with a lavish breakfast the next morning. Two-night packages range from $530 to $595, with three nights ranging from $625 to $675. 5. Inn at Ormsby Hill, Manchester, VTVisit the Inn at Ormsby Hill on the first two Saturdays in December for open tours of the inns in the Manchester area. Stay either the night of December 3, 2010 or December 10, 2010, and receive dinner in the evening, followed by a performance of “A Christmas Carol” at The Dorset Theatre. Open house tours run from noon to 4 PM the next day, with the $15 ticket price going to Habitat for Humanity. On your way home, you’ll have the chance to stop by a local nursery and pick up a Vermont Christmas tree to bring home!